Do you have a heart for honoring our Veterans? Then join the Ultimate Givers of Crossroads Hospice by volunteering to visit our Veteran patients. Volunteers provide companionship and support for hospice patients and their families in nursing homes, assisted living facilities and their own private homes in your community. Activities may include reading, playing board games or cards, talking, singing, writing letters, or just sharing stories. 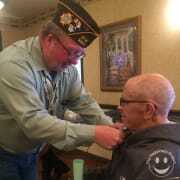 We also encourage you to participate in Veteran Pinning Ceremonies.